Devi Mahatmyam or Devi Mahatmya is also known as the Durgā Saptashatī (ढुर्गासप्तशती) or simply Saptashatī, Chaṇḍī (चण्डी) or Chaṇḍī Pāṭha (चण्डीपाठः) – where pāṭha – “reading” – refers to the act of ritual reading. The text contains 700 (saptashata – “seven hundred”) verses, arranged into 13 chapters. By far the most important text of Shaktism, the text has a central place in Shakta ritual. 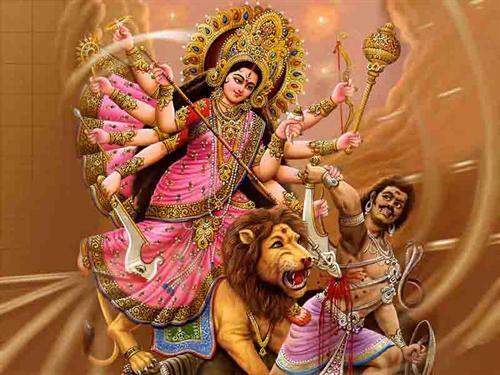 It is a Hindu text describing the victory of the goddess Durga over the demon Mahishasura. Guruji Sri Narendra Babu Sharma has asked to read Durga Sapthasati everyday in Rahu Kala. There are 700 verses in Durga Sapthasati Guruji Sri Narendra Babu Sharma has asked to read atleast one verse each day in Rahu Kala. He has asked to purchase the book of Durga Sapthasati with meaning, each verse has its own meaning related studies, finance etc.. If you know the meaning you can read the required Slokas in Rahu Kala. If you are not able to read, atleast play the CD's or Cassettes of Durga Sapthasati and listen to it. In this post, you can get Durga Sapthasati in .pdf format (Document) and .mp3 format (Audio). Download Durga Sapthasati in 3 CD's by Prakash Kaushik which includes the following sukatham kavachams besides the Devi Mahatmyam slokas, which is beautiful and clear in mp3 format, so that if you cannot read, atleast you can play these CD's & listen to it. Thanks to vanamaali, for giving us these CD's. Thanks to Vivek Vaidyanathan, for giving us the Document. hi, all the links are working, please check it out properly. tanx alot u have done a good work. Koti namaskarams. Yomen serivce of spreading the Devi mahatmyam and fill the minds with devotion. I request you to Srimad Narayaneeyam of Melpathur Narayana Bhattathiri also. Namaskarams. Thanks for posting Srimad Narayaneeyam. I am listening this almost everyday. I tried downloading the file.. document gets downloaded partly, in the first cd few files are missing, in 2nd CD, chapter 8 is missing. Can you help me!! @Shuchi, In the above file nothing is missing, everything is correct, please check it out properly. Any way, Here is another version of chanting of devi mahathmyam from Srivatsa Ramaswamy. Text followed in this chanting has variations with that of Prakash Kaushik. There are 13 chapters and 16 mp3 files. Thanks for sharing, I earlier had it purchased, somehow I was missing two of the chapters and it was of great help by listing the chapters and the contents. May godess devi shower all the bliss during this navaratiri. Superb . Thanks a lot for i came to know about this right now ,which i had been looking from a long time . thank you very much, i have downloaded devi mahatmyam, all are working fine and they are great. i was looking as to where i download prakash kaushik sapta shati,thank you. Thanks a lot. This is really very good. But the link for 2nd CD is not working. Tried many times. Could you pls check? The link for Devi Mahatmyam - Prakash Kaushik CD - 02 is not operational. Pls check. The link for Devi Mahatmyam - Prakash Kaushik CD - 02 is working. I have no problems in downloading. Please do check again and let us know. Thanks a lot for such an wonderful contribution to the religious world. May God bless you. Thank you very much for this. Wonderful contribution, May god bless us all! Excellent rendering of saptashati with constant tempo.